Description: this medium sized bipedal carnivore sports an elaborate paint job, which basically consists of four layers. The lowest layer is found on the underside (throat, belly, lower tail, sides of the limbs) of the figure, and is dark blue. Secondly, a light blue tone, almost white, covers most of the arms and legs, as well as parts of the flanks and head. It gradually shifts in the third, most noticeable colour, a bright green, which is found on most of the flanks and head, middle part of the tail, and in three stripes on the sail. Last, a dark purple paint job covers the back of the head, upper part of the legs and tail, and the whole back of the creature. Additionally, purple spots are seen on the animal’s head, flanks, upper legs and tail. Finally, the same shade of purple adorns the sail in three stripes as well as three rows of small spots on each side of the sail. A black JP: Site B logo is found on the upper left leg, with the number .39 next to it. The claws are not painted in a different paint job, unfortunately. The creature assumes a walking stance, with the right leg posed in a backward move. This position causes problems: the sculpt can’t stand on its own accord (despite its large flat feet) and must lean on something to stand up. This dinosaur features an attack action: pull the left arm down so the mouth will open, revealing a snake like scarlet tongue, as well as a not very impressive set of teeth. This also produces a roar, which is relatively high pitched, at least more than you might expect of a carnosaur like this. Analysis: Kenner once again opted for originality with this figure, the first, but certainly not the last, Spinosaurus toy of the JP lines. Because of Spino’s appearance in JP III the originality factor has diminished, but back then this dinosaur was less well known, and made for an interesting addition to the line. Unfortunately, it’s not the best Kenner sculpt and leaves much to be desired. Most irritating is the fact this sculpt can’t seem to stand up because of the position of the right leg. If it’s not supported by hand or some object to lean on, it simply falls down, making this predator look rather silly. The attack action is also not very convincing: the figure has a rather small mouth, an odd tongue and tiny teeth. The mouth does close with some force, making this figure more of a ‘snapper’ than a ‘slice’: this makes it able to knock down figures, but it can also clamp body parts of figures between it’s jaws. The paint job is fifty-fifty. The dark tones and even the green are satisfactory, but the light blue clashes totally with these colours. More vexing is the fact this critter’s claws are unpainted. The attack roar is not all that bad though. It’s less thundering and awe-inspiring than the various Rexes’ noises, but gives this creature a bit of his own character. Playability: limited. Though all limbs are poseable, the legs can only be moved to a low degree because the body gets in the way. The same goes for the arms, one of which has an attack action to support, which restricts playability options further. The mouth can open and close, but it’s pretty small so there’s not much you can do with it. And since this is an electronic figure you must be careful with it if you want to keep it in working order. 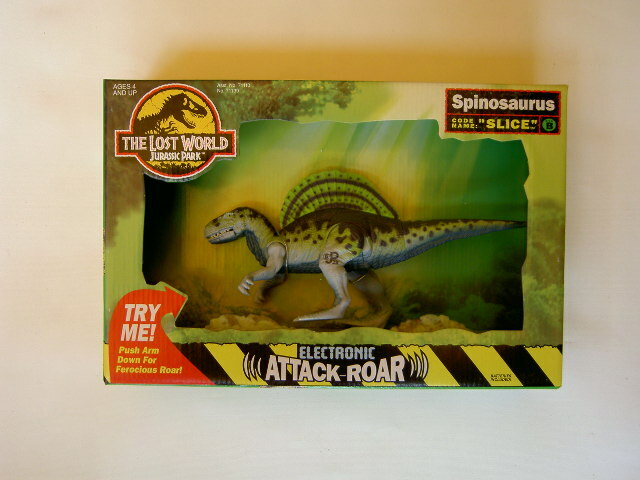 Realism: Spinosaurus had not yet entered the JP franchise by the time this figure was released, so it looks different from the JP III Spinosaurus that has now become so recognizable. Still, the sail on its back is a dead giveaway and makes sure this creature can’t be mistaken for any other carnivore. Compared to the human figures this animal is way too small, since even back in 1997 Spinosaurus was known to be one of the largest carnivorous dinosaurs (though its status as the biggest of them all had not been confirmed by then). Incidentally, the roar this sculpt produces is reminiscent of the sounds Hasbro’s JP III Spinosaurus figures featured. Repaint: no. This animal would be repainted once for the first JP Dinosaurs line though. Overall rating: 5/10. Despite adding more diversity to the TLWS1 toy line, this is not a very good figure. Its action feature isn’t impressive and it can’t stand on its two legs. The paint job had potential, but is overly festive for my taste. It’s not a total loss but could have been better. It’s not particularly rare, so won’t be too hard to track down at a reasonable price, should you really want one.